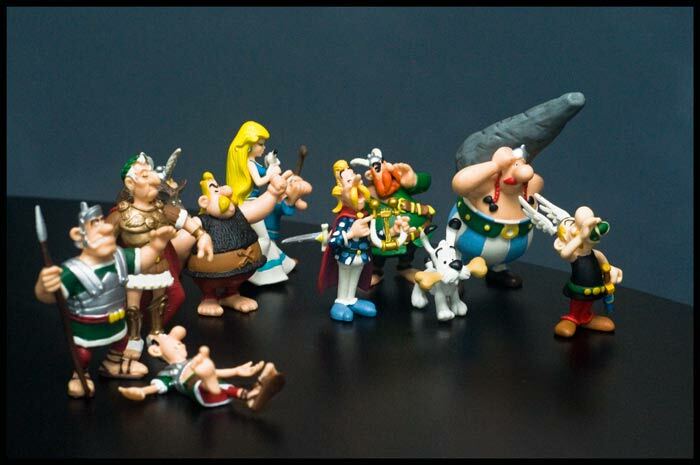 Yeah, that's pretty much the entire Astérix universe on our dining room table. All kinds of old-school Latin geekiness will be roused by seeing this, I'm guessing. We had a French visitor recently ask if there was anything she could bring us from Paris. I might have mentioned that these guys are nearly impossible to get here in the states (but told her not to stress about it because we are hoping to take a trip to Montreal in August). She showed up with practically the entire Plastoy Astérix collection! * Even Dogmatix! We already have all the Astérix videos that have been dubbed into English and the kid enjoys them and the whole idea of the magic potion (our favorite right now is 1968's Asterix and Cleopatra). These will be much-played with around here. And not just by me, I swear. I have received quite a few emails (and yesterday, a few comments) requesting I share some of my favorite classical toys and books for kids, so watch out for a detailed post about that in the near future (and nothing on that list will require kindly French friends). *And wait until you see the French kids clothes she brought. The sales were on in Paris.